OK. The wait has been worth it, almost. I found my Grandparents and their children, on the farm. Haven’t found my parents, but they can’t be too far away, as they lived on the same farm, but there was a road running through the farm. What I found most interesting was the next entry. Long story short. Those of us who grew up on the farm, as children, had a “best friend” who lived with his mother across the road. 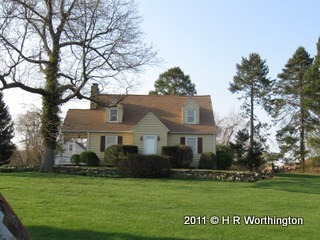 (what is a historical home in Chester County). His mother was the housekeeper for two “lady Doctors”. The Census Entry, confirmed a live long belief, but never thought it would have listed as “Head” and “Partner”. This entry was posted on Monday, April 2nd, 2012 at 4:30 pm and is filed under Genealogy. You can follow any responses to this entry through the RSS 2.0 feed. You can leave a response, or trackback from your own site. Congrats on your find Russ! For me the wait was not worth it – I couldn’t get on yesterday and now it turns out my great grandmother’s home wasn’t counted! I went through the whole ED and a second ED for that street. She lived at 291 7th Ave. in Newark and the enumerator lists 287, 289, 293, 297, 299, 301. Neither 291 nor 295 were added to any other pages, either. I also checked the addresses for my granduncle, great granduncle and his ex-wife, and none of them were found at the addresses I had for them from WWII records or directories in the 1940’s. My grandparents were in EO in 1930, in Bloomfield in 1935 and in EO in 1944 so my next step is to search all of EO. At least I’ve got something to keep me busy! I am going to be looking in Newark later today. I’ll take a look for you. Are there 1940 City Directories for Newark? If I see anything, I’ll get back to you. Thanks Russ. I know Lydia Wood & Sarah Guilds were living at 291 7th Ave. and that address simply wasn’t listed in the census. Lydia’s son, Howard Wood, may have been living with them – he was in 1930 but his WWII draft card had him on N. 11th (he doesn’t show up as the person living at that address in 1940). Lydia’s brother, Fred Guilds, was separated from his wife possibly even before 1930 – I haven’t been able to locate them even in 1930. His WWII draft card has him on Columbia St. and gives his landlady’s name. I found her in 1940 but he isn’t there. I also found a 1935 directory listing for him at 293 7th Ave. but he isn’t listed there in the 1940 census. (He did have a serious trolley car accident and could potentially have been in a hospital during either 1930 or 1940 census – I don’t know the date of the accident. He’s also listed in directories for 1924 & 1932 at 291 7th along with his sisters.) I found a 1930 directory listing for him at 71 S. 13th so I went looking for that address in the 1930 census. I found a John J. Giles (alternative spelling but wrong person) at that address. Mystery man! Fred’s ex-wife, Laura Guilds moved to Harrison/Kearny but I don’t have a date for that either. She’s actually listed in the 1948 directory as a widow (Fred didn’t die until 1970) with her mother, Laura Ledig. The Parnership could be a reference to their work–both being doctors together. My grandmother was listed in the census with her four children, no husband, and another woman (a partner). Both were listed as waitresses in a cafe. I can’t wait to ask my aunts about this cafe and who this person who lived with them was! I totally agree with you, and it’s probably that case, in the record I looked at.